Pitzer finished renovations of the Infirmary as part of the Robert Redford Conservancy and opened it for classes in January. Pitzer College has begun its renovation of the Infirmary and construction of two new outdoor classrooms to replace the previous one. Harvey Mudd plans to restrict access to the Foothill entrance (which is on the part it bought) within the year. Permanent protection for the TRP has still not been announced. The sale of the east field was completed in June 2015. CUC has not yet kept its 2011 promise to permanently protect the Temporarily Restricted Property once the sale went through. If you wish to comment to the college presidents about keeping this promise, their email addresses are in the November 2015 newsletter. No actual purchase of any of the three parts of the east field has been announced yet. There is no further news about the proposed Robert Redford Conservancy. We are very happy to be able to say that Claremont Graduate University has submitted a master plan to the City which clearly states they have no plans to build on their part of the BFS within the next 20 years. The BFS has been given an NSF planning grant (for more details see the June 2013 newsletter). 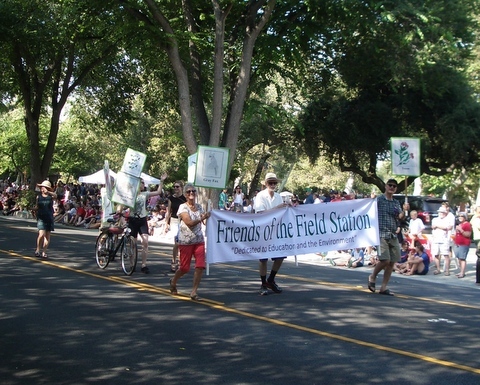 The FBBFS contingent at the Fourth of July parade was small but enthusiastic this year, displaying the new banner! The City Council approved a lot line adjustment for the area from College Ave to the western edge of the Temporarily Restricted Property (TRP; the center 40+ acre strip from Foothill up the ‘neck’—see the map on any newsletter). This was requested so that Claremont Graduate University and Harvey Mudd College would both have Foothill frontage on the parts of the western BFS they now own. The City Council approved a lot line adjustment that divides the area between the eastern edge of the Temporarily Restricted Property (TRP; the center 40+ acre strip from Foothill up the ‘neck’—see the map on any newsletter) and Mills Ave into three, 12-acre parcels. and text that relied on their existence has been struck out.